2. It is geometric, so it can be placed on any side down according to where it is put and what you are going to grow. 3. 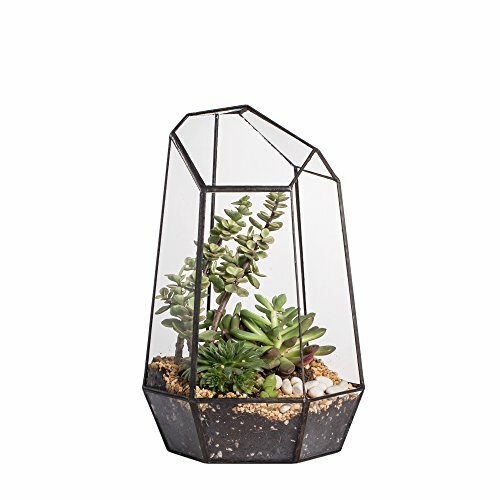 Geometric terrarium is a great decorative piece on your desk, table, shelf, etc. 4. Terrarium is a decent way to raise plants and watch them, without dirting your room. 5. A geometric terrairum will be a great centerpiece on a wedding, party. 6. Many people love to create their dreamy world, or a fairy story within a terrarium. 7. Those terrarium can be used as candle holder (please choose LED candles, it is not designed for high temprature). 8. A super mini miniature figure is included as free gift. 9. Special features: This is a irregular prism geometric terrarium, great for centerpiece. It is large. The height is 25cm.